There are many reasons why landscape architecture "has gained stature in the public's imagination," as Alan Brake, Executive Editor at The Architect's Newspaper recently editorialized. In sorting through the many notable developments in landscape architecture this year, it's clear that the repercussions of Hurricane Sandy on the Northeast coast will have a profound impact on the planning, development and redevelopment of our coastal cities and communities - all areas of great strength in the profession. Other emerging trends in the public realm range from cosmopolitan centers like San Francisco and Los Angeles to sparsely populated Nicodemus, Kansas. In addition, the importance and influence of Modernism, already established for architecture and design, is increasingly acknowledged in publications and with the preservation, design, and designation of actual sites across the country. Hurricane Sandy's tens of billions of dollars of property destruction, heavily flooded communities, New York City's submerged subway system, thousands upon thousands without power - and the tragic cost in human lives - quickly sharpened the attention of national, state and municipal officials on planning fundamentals and would seem to finally be erasing doubts about climate change. Indeed, a New York Times article about the city's future included this disturbing sentence: "Klaus H. Jacob, a Columbia University seismologist and an expert on urban environmental disasters, said the century-event of Hurricane Sandy could become, because of rising seas alone, an annual occurrence by 2100." SCAPE/LANDSCAPE ARCHITECTURE PLLC proposes an extensive network of oyster beds for storm surge mitigation and water filtration. 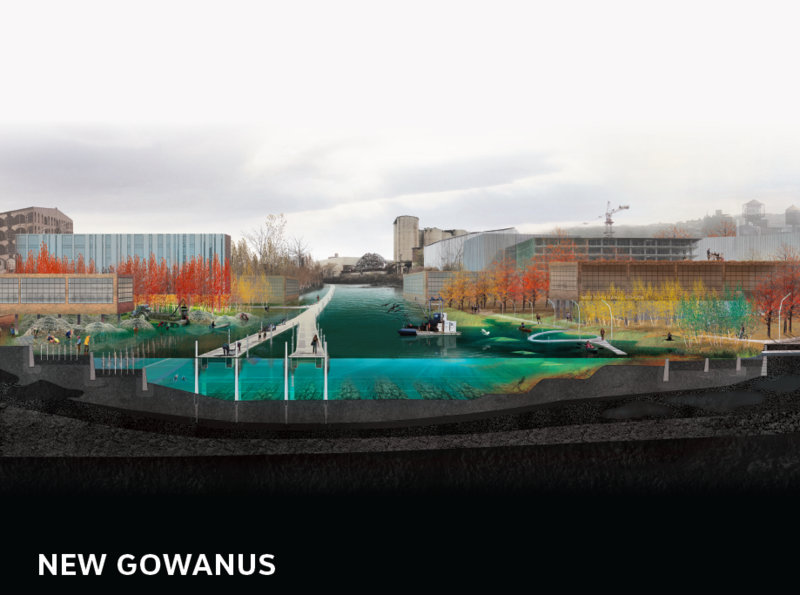 A pilot project is underway in New York's Gowanus Bay. Images courtesy SCAPE/LANDSCAPE ARCHITECTURE PLLC. 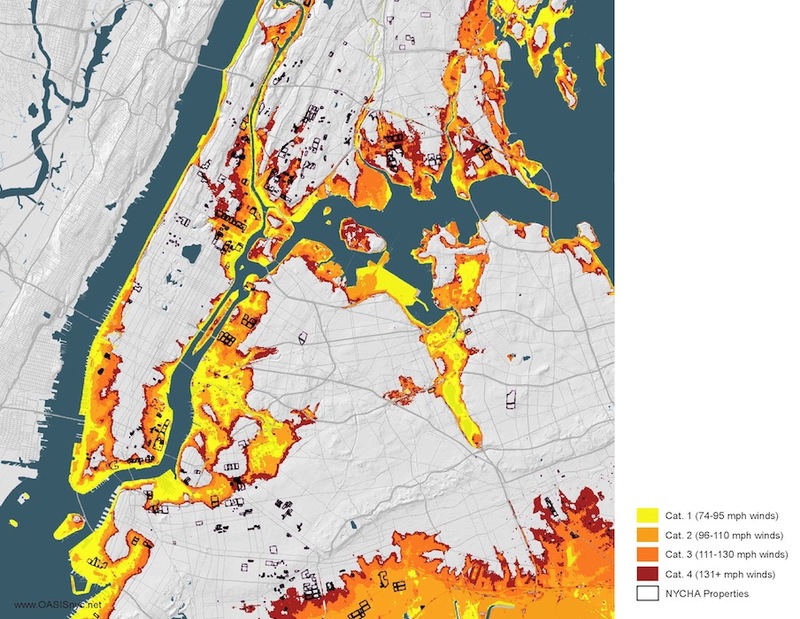 Following Sandy, some New York Times articles and an ABC News feature focused on landscape architect Kate Orff's prescient 2010 proposal for mitigating storm surge in Brooklyn's Red Hook neighborhood (which was badly hit by Sandy) and Gowanus Bay. She and her firm SCAPE/LANDSCAPE ARCHITECTURE PLLC suggested using an extensive network of oyster beds (which once covered 25% of the city's harbor), to both offset any surges and as a natural water filtration plant, which is pretty ingenious since the Gowanus Canal is a Superfund site. Map showing potential flooding of New York City during Category 1-4 hurricanes and locations of New York City Housing Authority facilities that would be impacted. Image courtesy dlandstudio. Meanwhile, another New York Times article discussed the work of landscape architect Susannah Drake who, "curious about the placement of New York City's public housing, devised a map to find out how much of it was built on flood zones. The answer, she discovered, was, most of it. Public housing lines the waterfront in Coney Island, on the Lower East Side, in the Rockaways." Drake and Orff are the kind of thinkers in the landscape architecture profession that I expect and want to see at the table guiding design and development decisions. 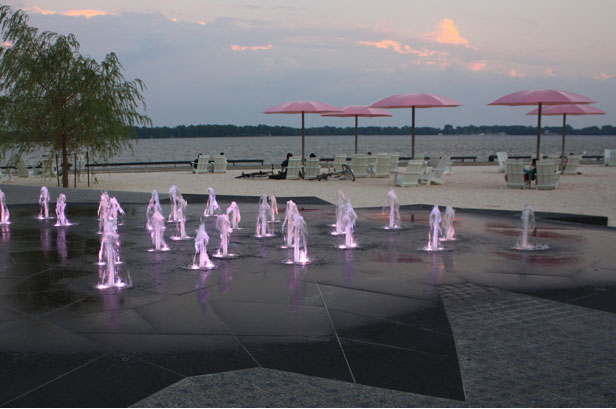 Sugar Beach - landscape architecture by Claude Cormier & Associés Inc. Photograph by Nicola Betts, courtesy Claude Cormier & Associés Inc.
Now let me turn to some newly opened projects that warrant attention starting with Sugar Beach on the Lake Ontario waterfront in Toronto designed by Montreal-based Claude Cormier & Associés Inc. This is landscape architecture that embraces the site's past, including the Redpath Sugar Factory, and the city's broader industrial legacy, and does so with panache and verve. It's a strong example of work that balances nature and culture and effectively uses culture as a design mechanism. Appropriately, it received an Honor Award from the American Society of Landscape Architects (ASLA). Golden Gate Overlook - landscape architecture by Marta Fry Landscape Associates. Image courtesy the Golden Gate National Parks Conservancy. San Francisco's Golden Gate National Recreation Area has seen a tremendous amount of activity. 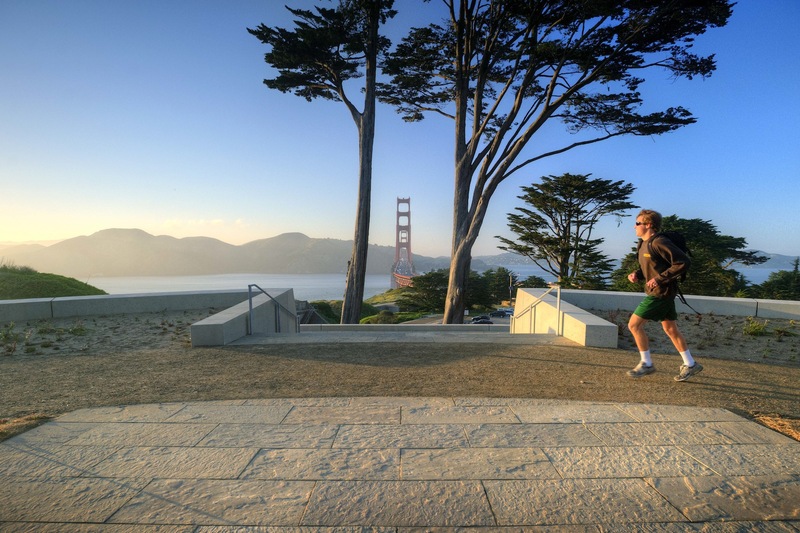 Two major players - the Golden Gate National Parks Conservancy and the Presidio Trust - have taken leadership roles in shaping this national treasure and in the process have engaged an extraordinary number of Bay-area landscape architects. 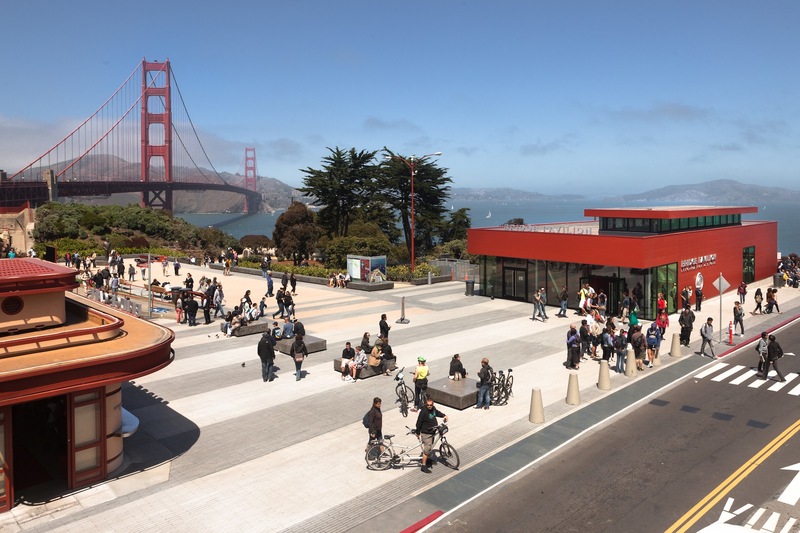 Golden Gate Bridge Pavilion Plaza - landscape architecture by SURFACEDESIGNINC. Image courtesy the Golden Gate National Parks Conservancy. In 2012 alone, seven projects under the Conservancy's auspices opened to the public, including the Golden Gate Overlook (Marta Fry Landscape Associates), the Pacific Overlook (Presidio Trust - Rania Reyes), the Golden Gate Bridge Pavilion Plaza (SURFACEDESIGN INC) and the Lands End Promenade (Stephen Wheeler Landscape Architects). Elegance of design, sustainability, intelligence of siting, and an understanding of the continuum of nature and culture - all through the lens of Modernist expression are hallmarks of these significant projects. Sunnylands Center for visitors at the Annenberg Retreat at Sunnylands - architecture by Frederick Fisher and Partners - landscape architecture by The Office of James Burnett. Image by Dillon Diers Photography, courtesy the Annenberg Retreat at Sunnylands. Further south, in Rancho Mirage (near Palm Springs), California, Sunnylands, the 200-acre former estate of Walter and Leonore Annenberg, has recently become an international conference center where, according to their Web site, "national and international leaders from a range of fields-beginning with the President of the United States-may convene to 'promote world peace and facilitate international agreement'." A new nine-acre Sunnylands Center for visitors by architect Frederick Fisher and landscape architect James Burnett, which takes its Modernist cues from the A. Quincy Jones-designed Annenberg residence, has just opened to great acclaim, and is also an ASLA Honor Award recipient. Grounds of the Sunnylands Center for visitors at the Annenberg Retreat at Sunnylands - landscape architecture by The Office of James Burnett. Image by Dillon Diers Photography, courtesy the Annenberg Retreat at Sunnylands. The landscape respects the hot desert climate with its use of cacti, agave, yucca and others, but does so with non-desert like abundance. If solving world problems (or any other nettlesome issues) is on your agenda, strolling through Burnett's brilliant design is a terrific place to cleanse and sharpen your mind. 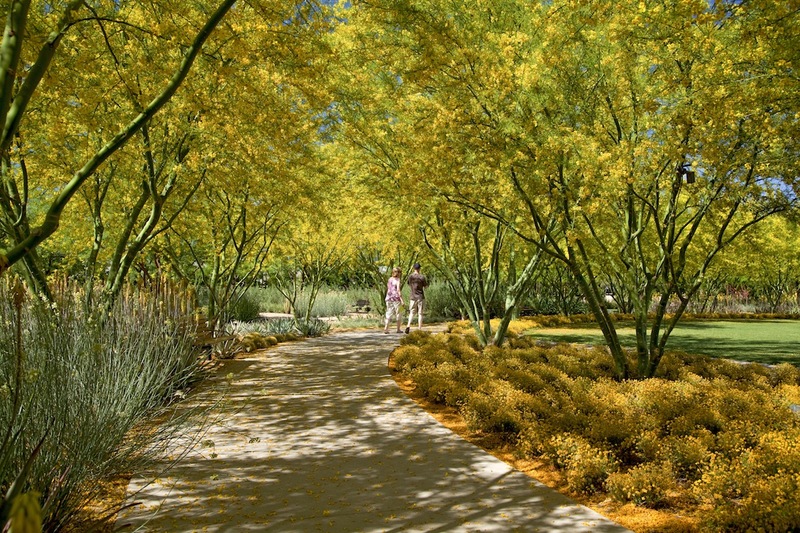 Grand Park - landscape architecture by Rios Clementi Hale Studios. Photograph by Jim Simmons, courtesy Rios Clementi Hale Studios. Meanwhile, in downtown Los Angeles, Rios Clementi Hale Studios transformed a largely overlooked open space into the landmark 12-acre urban Grand Park. The design sensitively incorporates historic fabric, addresses a 90-foot grade change while creating a destination replete with lawns, terraces, plazas, and gardens that both reflects and embraces the city's diversity. Street furnishings in an exuberant magenta animate the park as year round blooms, while each of the four blocks offer distinct destinations within the overall campus (and judging from the park's Facebook page they are popular and well programmed). Among the most fascinating blocks is the Community Terrace with gardens representing the six Floristic Kingdoms--South African, Boreal, Australian, Neotropical, Paleotropical, and Antarctic. 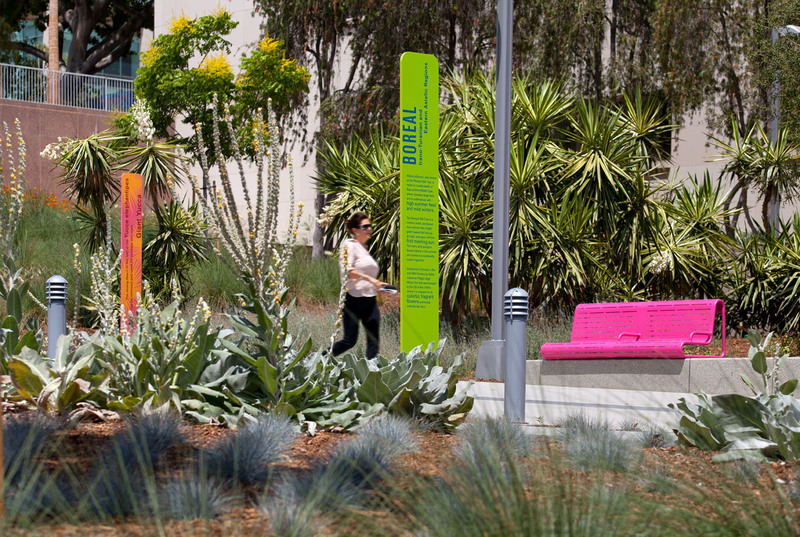 Thanks to LA's climate, this ecological diversity can be presented in one space. Under-appreciated National Parks were the subject of the Parks for the People competition organized by the Van Alen Institute and the US National Park Service (NPS) with the goal of "reimagin[ing] America's greatest natural and cultural treasures--its national parks." The 41 competition proposals submitted were winnowed down to two Awards of Excellence and six finalists. One of the two Awards of Excellence went to a team from the City College of New York (CCNY), which developed an innovative interpretive approach for the Nicodemus National Historic Site, a town in remote north central Kansas founded by African American homesteaders in the 19th century and the oldest and only remaining town of its kind. The winning proposal, called Nicodemus Web, recognized that most visitation to the site would be done online and responded with a virtual network of Nicodemus residents, descendants and other affiliates. For those who actually visit the town, the CCNY students also created a trail system and interpretive elements that show original homestead sites. Finally, Modernist landscape architecture saw advances on several fronts. 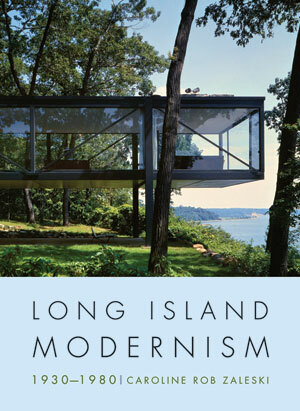 A sweeping and authoritative new book, Long Island Modernism 1930-1980 by Caroline Rob Zaleski thoughtfully covers the astonishing architectural and landscape architectural achievements in the area. 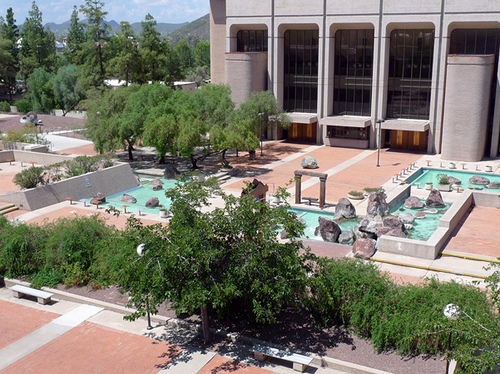 And speaking of acknowledgements, four Modernist sites are advancing towards listing to the National Register of Historic Places, which is significant because while there are more than 88,000 National Register sites, less than 2,000 are designated with significance in landscape architecture. M. Paul Friedberg's Peavey Plaza in Minneapolis (about which I've written previously) and Richard Haag's Gas Works Park in Seattle, WA, are both in their final stage of national level approval. Two more sites - Garrett Eckbo's Tucson Community Center and Lawrence Halprin's Open Space Sequence in Portland, OR - are awaiting State-level approvals before their nominations head to Washington, DC. These notable developments all point back to Alan Brake's editorial noted at the beginning. Landscape architecture is gaining in public stature and it's because of entrepreneurial students at CCNY and elsewhere, practitioners like Kate Orff and Susannah Drake, organizations like the Golden Gate National Parks Conservancy and the Presidio Trust, and many others that the profession and its practitioners are being recognized as leaders capable of integrating nature and culture to shape our future.